Image of a little girl, with a red ribbon in her hair and dressed in white with white shoes and socks; her hands are clasped in front of her in a pleading stance; before he, alphabet blocks spell out the words "Buy Me a Victory Bond"
Canada's /Weak Spot/1 in 23/of the/Population of/GREAT BRITAIN/Bought Victory Bonds/1 in 27/of the/Population of/U.S.A/Bought Liberty Bonds/1 in 187/of the/Population of/CANADA/Bought our last Loan/Are You Satisfied? Point faible/du Canada/1 sur 23 …/1 sur 27 …/1 sur 187 …/Etes-vous satisfaits? "Allons!/Finissons La Besogne/Souscrivons à/l'emprunt de la victoire"
Image of a Canadian soldier standing in a field of poppies, his head bowed as he looks down at a simple wooden grave cross; he holds his helmet in his left hand and has his rifle slung over his right shoulder; in the background are the ruins of a house. The quotation is from the poem "In Flanders Fields"
On the night of June 27, 1918, the German submarine U-86 torpeodoed and sank the hospital ship Llandovery Castle, resulting in the loss of 146 officers and other ranks, including 24 Canadian Nursing Sisters. Pour le Réintégrer/Dans la Vie Civile/Souscrivons à/l'Emprunt/de la/Victoire"
Image of a shield [the Honor Emblem? ], the top part of which is the Union Jack and the bottom part of which is a coat of arms of the Prince of Wales and the words "100% Victory Loan 1919"
Image of a shield [the Honor Emblem? 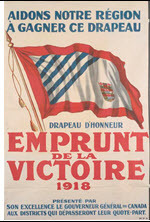 ], the top part of which is the Union Jack and the bottom part of which is a coat of arms of the Prince of Wales and the words "100% Emprunt de la Victoire 1919"
Image is a button with a white ensign, bordered in red, bearing the Union Jack in the upper left and the coat of arms of the Prince of Wales in the lower right, and the words "Investor 1919"
Image of the same little girl in NEW F 01 and CAN GEN 03 but this time she's in a jumping-up-and-down-in-glee pose; at her feet are blocks spelling out "Buy Me A Victory Bond"
"Donated to Victory Loan 1918/by the makers of Magic Baking Powder"
Image is a pennant [the Honor Emblem? ], the top part of which is the Union Jack and the bottom part of which is a coat of arms of the Prince of Wales and the words "100% Emprunt de la Victoire 1919"
Image of a soldier who has taken off his uniform and is rolling up his sleeves to begin the work of plowing a field; beind him is a rainbow and in the distant background is a city with smoke coming out of several smokestacks; the image is captioned: "After the Storm"
In the lower right-hand corner is the Canadian War-Savings Stamps logo: a beaver sitting on the top of an inverted equilateral triangle containing the letters WSS. Image of two boys standing beside a wall bearing a circus poster featuring a clown and performing dog and horse. 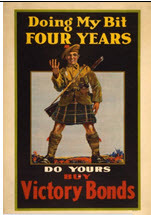 The boy on the left faces away from the viewer looking at the poster, whereas the boy on the right faces the viewer and holds "thrift cards"
Image is a Canadian soldier wearing a greatcoat and carrying a lot of gear pointing, with his right hand, to an image of two German soldiers surrendering and, with his left hand, to a sign that says "National Saving"
Image of two hands bursting out of a drawing of the map of Canada; the hands are holding a sign that reads: "What have YOU done to help win the WAR?" $25.00 for $21.50/Buy/War Savings Certificates/ … "Make Your Dollars Fight at the Front"
Image of a beaver perched on one side of an equilateral triangle in which are printed the letters "W-S S"
Will You Take/Your Change in/Thrift Stamps? Three images: (1) A hand holding a certificate; (2) A hand holding a war-savings stamp book; (3) A beaver perched on one side of an equilateral triangle in which are printed the letters "W-S S"
Image is head and shoulder depictions of a Canadian soldier and his wife; the soldier is holding a baby; his wife is clasping her hands together and looking at her husband. 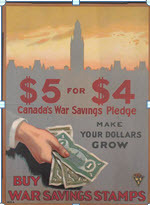 Two images: (1) Upper-torso image of a soldier, with backpack, who has plunged the bayonet on his rifle through the letter "I" in the word "Fight"; (2) Upper-torso image of a laborer, wearing overalls and a cap, putting a dollar bill into a box labeled "The Canadian Patriotic Fund"; behind the laborer are factories with smoke coming out of their chimneys; the image of the laborer is captioned "His Monthly Gift"
Sugar Makers Help!/The Red Cross Wants Maple Sugar/& Syrup for Our Wounded Soldiers/Help and Give! Sucriers; de l'aide!/La Croix Rouge a besoin de sucre/et de sirop d'erable pour nos/soldats blesses/Donnez et Aidez! The Empire's Need/Men/Munitions/Money/Which Are You Supplying? Image of two young women, wearing white dresses with blue armbands with the Y.M.C.A. triangle, serving coffee and doughnuts [?] to soldiers; behind them are several hundred soldiers flanked by a train and a ship; above the table, on chains, hangs a sign: Free/Service/Canadian/Y.M.C.A. Man in khaki-colored knickers and shirt, wearing a red neckerchief and a Boy Scout leader-style hat, poling a raft down a river; each log of the four-log raft is labeled: "War Veterans"; "Y.M.C.A. "; "Community Service"; and "Repatriation League"
Image, in silhouette, of a windmill and church with a steeple in front of a rising/setting sun; on each of the four blades of the windmill are the words/phrases "war veterans"; "Y.M.C.A. "; "Community Service" and "Repatriation League"
Knights of Columbus/Dominion-wide Appeal/September 15th to 23rd/$500,000.00 Needed/for His Sake/Give! Give! Give! Image of a fish on a plate surrounded by an assortment of vegetables; also logo of the Canada Food Board's S.O.S. Canada's Butter Opportunity!/Canada must do better than this [selling so little butter to Britain]/"Keep Britain's Butter Plate Full"
Poster shows four plates of butter, representing the amount of butter Canada sold to Great Britain before the war, the shortage of butter in Britain due to the war, and how much butter Canada had sold twelve years earlier and how much less Canada had sold two years earlier; also logo of the Canada Food Board's S.O.S. 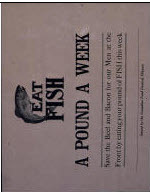 Image of a butcher pointing at two fish on a plate as a female customer looks at them; in the background, on a shelf, are chunks of meat; in the background is a sign that reads "A Good Butcher"; also logo of the Canada Food Board's S.O.S. Image of a man and woman with bags of hoarded flour and sugar looking at the silhouette of a policeman walking by their blind-covered window; a Canada Food Board statement, detailing fines for hoarding, hangs on the wall; includes logo of the Canada Food Board's S.O.S. Canada's Egg/Opportunity/ "Very little eggs for such a big bird"/Canada must do better. Image of an enormous chicken and of two figures, one representing Great Britain and one Canada, plus four eggs, representing egg production in Canada and sales to Britain; includes logo of the Canada Food Board's S.O.S. Canada's Pork/Opportunity/"We're glad to/have it, Canada,/but we need/ten times more"
Image of two figures, one representing Great Britain and the other representing Canada; Great Britain is offering money to Canada for a pig; also image of a large pig, indicating how many pounds of pork Britain buys, and a smaller pig indicating how much Canada sells; includes logo of the Canada Food Board's S.O.S. Image of a large steer, indicating how many pounds of beef Britain buys, and a smaller steer indicating how much Canada sells to Britain; includes logo of the Canada Food Board's S.O.S. Image of a boy in the "official uniform" of the "Soldiers Of the Soil" standing at attention and blowing on a bugle; behind him is a line of boys, some carrying farm tools, marching toward a field to help gather hay/wheat; includes logo of the Canada Food Board's S.O.S. 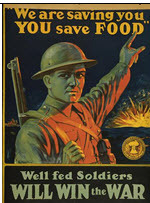 Image of a soldier pointing in the air; explosions in the background; includes logo of the Canada Food Board's S.O.S. Image of a young woman and an older woman standing before a table of fruits and vegetables, and some canned foods; the older woman, who is wearing a white apron, is holding up a jar and gesturing toward the table; includes logo of the Canada Food Board's S.O.S. Are You in League/with the Kaiser?/(Extravagant Ones) [say:]/"Yes! War or no war,/we live as usual. "/(The Kaiser)/[says:]/"Thank you, my Friends,/for you are indeed/my Friends."